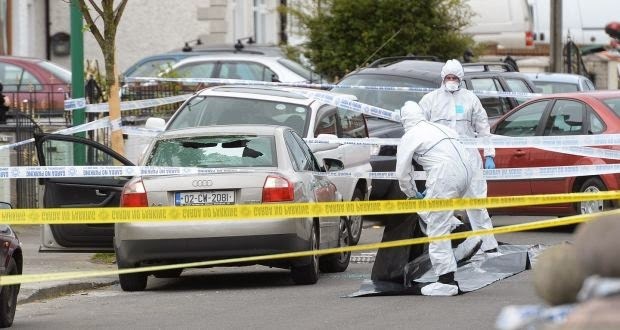 Gardai have launched a murder investigation after a known gangland figure was shot dead in Dublin this afternoon. The victim was wounded outside a house on Cooley Rd, Drimnagh, and pronounced dead. The 38-year-old former youth sports star was a suspected murderer who was charged with a fatal shooting but was recently cleared. He walked free from court after spending several years in prison on remand when bail was denied because he was a flight risk and over fears he would intimidate witnesses. A convicted robber, he had been warned his life was in danger and The Irish Oberver understands had taken precaution in an effort to evade any attempts on his life. Today’s fatal attack occurred at around 3pm. The Irish Oberver will not name the dead man until relatives have been informed. Regarded as a senior drug dealer, he had extensive contacts throughout the underworld in Dublin and was closely associated with the gang suspected of being behind the murder almost two years ago of Real IRA key figure in Dublin Alan Ryan. A Garda spokesman said gardaí at Sundrive Road were investigating. The scene is preserved pending a technical and forensic examination. The local Coroner and the office of the State pathologist have also been notified.